We at Sparklike conduct regular quality assurance protocol procedures to our devices. These procedures have been deemed necessary, since we are the developer and the manufacturer of the world's first and only non-destructive insulating glass gas fill analysers. Therefore, we thrive towards guaranteeing the highest possible quality for our production. 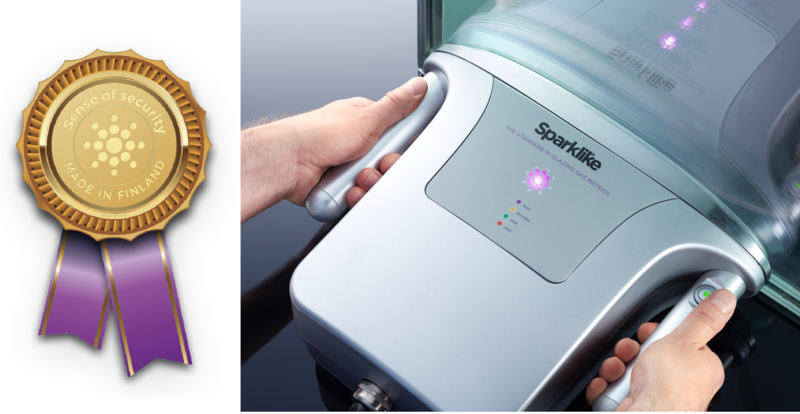 This blog post dives deeper into the Sparklike Laser™ quality assurance protocol, which is divided into two main procedures 1) the in-house quality test procedure and 2) annual calibration and maintenance service for Sparklike devices™. These two procedures are closely connected since the in-house quality test procedure offers some insight to how important the annual calibration and maintenance of quality control equipment actually is. The technology behind all Sparklike devices™ is Sparklike owned and patented, and therefore we consider these regular quality assurance protocol procedures highly important. In a nutshell, Sparklike Laser™ product line (formerly known as Gasglass Laser) allows the analysis of insulating gas concentration for triple and double glazed units. Measurement is also possible through coatings and laminated glasses. Sparklike Laser™ devices are based on laser technology (TDLAS), where the devices measure oxygen, and the results are converted to argon, krypton and other insulating gases. In order to better understand the need for annual calibration for any equipment, let alone for devices that are used daily for quality control, a good starting point is to compare the device's measurement accuracy before and after the device has undergone appropriate calibration and maintenance service. For that particular reason, the before and after testing approach has become the core of our in-house quality test procedure. Similar in-house tests are conducted also for our Sparklike Handheld™ device. You can access the blog post by clicking this link. The in-house quality test procedure is normally conducted in the following way: each insulating glass unit (IGU) is filled with pre-mixed 90% Argon gas. Furthermore, in order to obtain a vast measurement sample, each unit is tested 20 times from both sides. 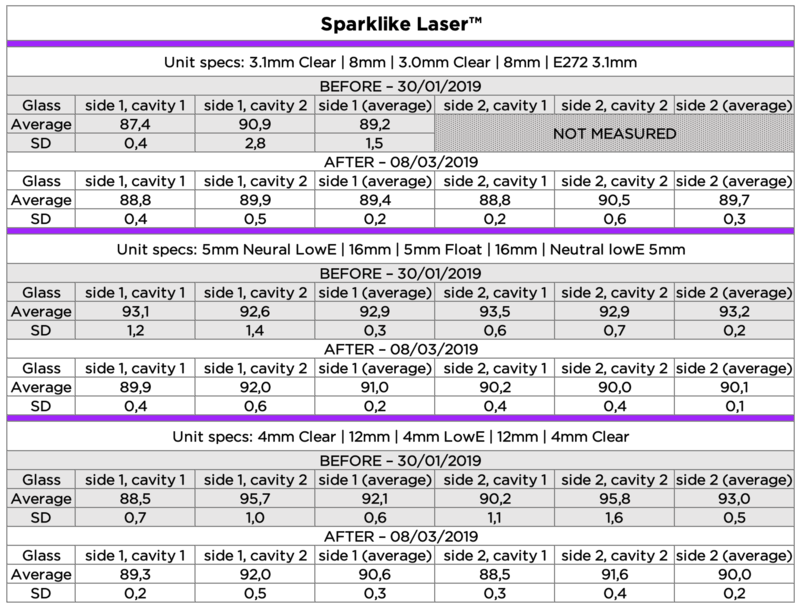 The below table shows Sparklike Laser™ test results before (dated on the 30th of January 2019) and after the device had undergone thorough calibration and maintenance (dated on the 8th of March 2019). Furthermore, in order to make the interpretation and comparison of the test results possible, the average and standard deviation (SD) values were calculated from the measurement results. In this particular example, the Sparklike recommended annual calibration and maintenance had not taken place for over 24 months. Therefore, before maintenance, most of the average results did not fall into expected values set for Sparklike Laser™ in-house quality test procedure. However, after the calibration and maintenance procedure, measurement precision improved, on average, by 1,1% for cavity 1, by 2,6% for cavity 2 and by 2,1% for the average value. In addition, before the maintenance, the deviations were significantly higher than if the device would have undergone annual calibration and maintenance. The above-presented precision improvements have been calculated in percentage points. To sum up, the Sparklike Laser™ in-house quality test procedure clearly highlighted the necessity for annual calibration and maintenance. "As for Sparklike Laser™ devices, it is crucial to service and check the control parameters and the optics of the device annually. Furthermore, this state-of-the-art measurement device also contains several moving components that require regular maintenance. 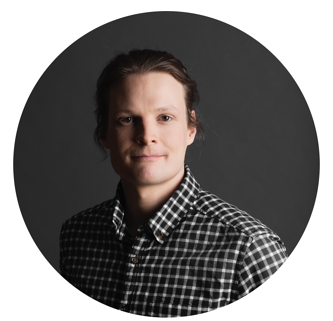 Without annual service, there can be a significant shift in the measurement results, " Sparklike's Production Manager, Mr. Ville-Petteri Säily says. In addition to these regular quality test protocols, as the manufacturer of the state-of-the-art quality control devices, we recommend that the devices should be services annually. The Sparklike Laser™ device presented in this blog post did not contain any defects. Therefore, only the following maintenance procedures took place: Sparklike Specialists ran the software updates, the laser beam was re-focused and re-adjusted, and the device calibrated. However, normally when the devices arrive for annual maintenance, Sparklike Engineers start the maintenance process by first testing the device's operations. As a general procedure, this means checking the parts for wear and tear defects. After testing the device's operations and replacing the most common wear and tear elements, Sparklike Engineers will perform an inspection and adjustment of optics. During the next phase, the Sparklike devices™ are calibrated by checking the reference measurements. If any variances occur, necessary actions will be taken to fine tune the device. Fine tuning in itself means analyzing the reference measurements and adjusting the insulating gas concentration readings throughout the whole measuring range. At this stage, several hundreds of measurements are being conducted using different references and methods to secure the reading accuracy. Click the following links to continue reading what happens during the maintenance service for Sparklike Laser™ devices and for Sparklike Handheld™ devices. Finally, as an innovation drive Nordic company, we at Sparklike are constantly developing our devices and services. Therefore, during regular device maintenance, the Sparklike Laser™ devices are further developed, in order to enhance the devices' operational reliability and performance. "A good example of such developmental improvement is the updated reflector added during regular device maintenance. This small improvement has led to an important increase in test result repeatability. With these simple enhancements, the Sparklike Laser™ devices experience increase in reliability and measurement accuracy, " Mr. Säily concludes. In addition to our Sparklike Laser™ quality assurance protocol procedures, we have also asked third party reviews, most notable the independent test laboratory testing.